For your guidance, the scripture is your astrologer. He knows your future, he knows your past. So therefore you should consult, you should consult, for our guidance. In my horoscope it is written there, "At the age of seventy years he will go across the sea." It is written there. Yes. And there are so many things still. So this astrologer was so accurate. I have got that horoscope. Not here. If some day I shall, then will show. It is clearly written there that "This time he will go across the sea." Just see. The circumstances became so that I have come. So astrology is so nice. Srila Prabhupada said that we not try and be more of a paramhamsa than him. Acintya means inconceivable. You cannot speculate how it is happening, how in the lotus flower there is so hard nail that immediately, within a second, it could kill a great demon like Hiranyakasipu. Therefore it is acintya. We cannot conceive. Acintya. And therefore Vedic instruction is acintya khalu ye bhava na tams tarkena yo jayet: "Do not apply your poor logic in the matters which is inconceivable by you." There is no logic that how lotus flower can grow nails. They say, "Mythology." Because they cannot conceive within their poor brain, they cannot accommodate how things happen like that, they say, "Mythology." Not mythology. It is fact, but it is inconceivable by you or us. It is not possible. Some atheistic devotees are more paramhamsa Mahaprabhu's own grandfather, Nilambar Cakravarti! Nilambara Cakravarti, who was a great astrologer, immediately prepared a horoscope, and by astrological calculation he saw that the child was a great personality. Gour Mohan De, Srila Prabhupada's father, who Srila Prabhupada called a pure devotee consulted an astrologer. "Please tell Me who I was in My previous birth," the Lord said. "Please tell Me by your astrological computations." Hearing the words of the Lord, the astrologer immediately began to calculate. Brahmanas generally used to become astrologers, Äyur-vedic physicians, teachers and priests...The important members of ISKCON should give careful attention to our Dallas school, where children are being taught Sanskrit and English to become perfect brahmanas. If they are actually trained as perfect brähmanas, they can save society from rogues and ruffians; indeed, people can live happily under the protection of qualified brähmanas. In other words, as Srila Prabhupada put, "Astrology can help if there is a first-class astrologer. *"
So this astrological calculation were then; still there are. In the Śrīmad-Bhāgavatam, when Śrīmad-Bhāgavatam was written, it was five thousand years before. It is stated there that in the beginning of Kali-yuga, there will be buddha-avatāra, incarnation. Vabhisekha [?]. Vabhisekha means "there will appear." These are śāstra, these are astrological calculation, everything perfect. The other day, when I was discussed about Sanātana Goswami, how even an ordinary hotel keeper, he kept an astrologer who told the hotel keeper that "This man has got eight golden dollars." Just see. This is astrology. Even a thief could be conducted, guided by astrologer, and what to speak of others. So that was their system in India. So that example is being placed here by Lord Caitanya that the Veda, that is astrology for your guidance. For your guidance, the scripture is your astrologer. He knows your future, he knows your past. So therefore you should consult, you should consult, for our guidance. 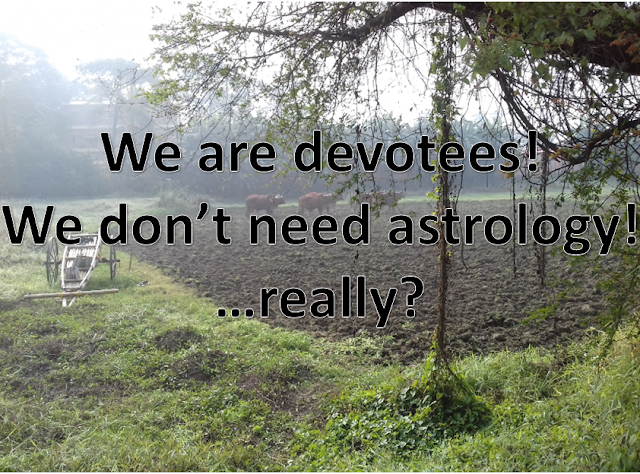 Is astrology accepted by our Sampradaya's Acharyas? Jaya-hari: Prabhupāda?, this morning you talked about astrology in your lecture. Is this accepted in the Vedic scripture and by the gurus? Prabhupāda: Oh, yes. Astrology means... That is also Vedic. Jyotir-veda. Jyotir-veda. That is also part of the Vedas. (break) The brāhmaṇas, they learn these three things: astrology and medicine. These two things. A brāhmaṇa is supposed to go to every householder's place, and he will inform, "Today is such-and-such tithi. The such-and-such thing should be done." And if required, if somebody inquires about "Now I am going to that place. What will happen? Just find out the auspicious moment," so they will give him. Still it is current. It may be wrongly done or rightly, but the system is still there, astrologer. The king should be always accompanied by a first-class astrologer. (break) ...there is a whole street, both sides simply astrology. (break) ...good astrologers. "... Nearby is Brhaspati who is reading out the planetary position (called Panchangam) of the day"
The Lord of Jupiter, brhaspati, he read's the day's planetary positions to the Supreme Lord Venkatesh Balaji every day. And we need more proof? How to go beyond astrology? Become a pure unalloyed devotee of Lord Krsna. But we have heard Srila Prabhupada say, “Krsna consciousness is beyond astrology, if you surrender"
Do note, 'if you surrender'. Self deceptive devotees who fancy themselves advanced are quick to catch the "beyond astrology" part and not the "surrender" part. This is called self deception. And the only person who will be at a loss is you! Prabhupada: Why not bring them? Abhirama: Yes. On Sunday we have arranged. They will come for a visit of Våndävana, and they will come to see you, to see if they can relieve you of some difficulty. As far as we could find in Delhi, these are the most reputed men, and they are actively practicing and teaching. They are recognized. Prabhupada: Make that arrangement. Yes. On Sunday? Abhirama: Yes, on Sunday, Srila Prabhupada. Today is Thursday. So these were the major points, Srila Prabhupada. For six months there's trouble, especially in first week of September. And if you can pass through '78, then he sees four or five years ahead clear. Tamala Krsna: That means divine intervention, Srila Prabhupada. Prabhupada: The chart is given. The calculation there is finished. That doesn't matter. Rather, if I am finished now, it will be glorious. Tamala Krsna: It will be what, Prabhupada? Tamala Krsna: Living will also be glorious. Prabhupada: Yes. Let us see.... As Krsna desires. All right. Thank you. Would you like to send to that Navadvépa astrologer? Prabhupada: You have got the janma? Tamala Krsna: Oh, yes. I'll have Abhirama... What he has given, I'll have him write it up and add it to that other report. I have a file I'm keeping in case you want to hear again. Pradyumna is here, Srila Prabhupada. Prabhupada: No, no. That is calculation, calculation. This astrologer, this astrologer was a very big astrologer and when I was in service, Dr. Bose's laboratory, so Dr. Bose was treating one patient. He was vomiting blood. So he was treating as tuberculosis. Then he could not cure him after giving all medicine. Then he asked the astrologer, this astrologer who made my horoscope, "What is the matter? Panditji, can you tell?" So he calculated. He said, "You are making wrong treatment. He has got some sore in the throat. It is not heart." And he treated, he was cured. Yasomatinandana: Vedic science is so perfect. Prabhupada: Yes. He knew it. Srila Prabhupada is actually beyond astrology, yet as an uttama adhikari who is tasked with preaching and hence externally acting on the the madhayama adhikari platform he consults astrologers and wears the appropriate gems when need be, since all of this is a regular practice under varnashrama dharma. Srila Prabhupada has the greatest gem, Lord Krishna, he doesn't need any gems to help him through a bad time, however to teach the rest of us by his personal example he does so. Srila Prabhupada had asked us to consult an astrologer, regarding whether he should travel. This afternoon, Yasodanandana Swami, Dr Sharma, and Bhakti Prema Swami each presented a report from a different astrologer. I asked each to give his report separately, so that we could see how they agreed and differed. Bhakti Prema's was useless, Dr Sharma's was fair, and Yasodanandana's seemed the most reliable. All three agreed on one point: the next two months would be the most difficult of Srila Prabhupada's life, and traveling was to be avoided. The astrologer Yasodanandana consulted recommended the wearing of a blue sapphire. After hearing all the reports that forecast his future, His Divine Grace said, "So it is not hopeless. At least for five weeks, keep me very carefully. For the time being, no travel. Secure this blue sapphire and chant Hare Krsna." “After lunch, Srila Prabhupada had me read again the astrologer’s report brought by Yasodanandana Maharaja. Prabhupada found it to be quite accurate regarding his past. For the future, it stated that Saturn was exerting a very bad influence, which could be counteracted by wearing a blue sapphire. Abhirama contacted Guru-krpa Swami in Hong Kong, who was going to purchase one there or in Delhi. Srila Prabhupada described the precaution to be taken with the valuable stone when it was purchased. "It should never be allowed to pass into another’s hands." So Srila Prabhupada even know about the precautions to be taken while purchasing it. Thus there must be purity in act of purchasing the gem as well. The sapphire ring was left on Srila Prabhupada’s body when it was put into samadhi on November 15 1977. But what should we say to those devotees under PMS, Prahlada Maharaja Syndrome, who think themselves beyond Varnashrama dharma? However the purpose of human life is Krishna bhakti. There is not astrological remedy for release from the cycle of birth and death. No astrology will help when death will be near. There is no gem which confers immortality. So astrology is never meant to replace the Vaishnava siddhanta only to compliment it in such a way that it amplifies the message of madacharya purogamaih our previous acharyas and does not mute it. Thus I always encourage them to perform devotional service very nicely and to view astrology or any of the Vedic sciences as not something which is above Krsna-Bhakti. Thus if you see all scriptures dealing with any of the Vedic sciences, they start with an elaboration on the purusha sukta, i.e., a description of the creation of the universe from Mahavishnu to Lord Brahma and the planets etc. This the tool to see all things and all Vedic sciences as an emanation from Lord Krsna and not separate from Him. However if you look at all karmis who engage in the study of any Vedic science they will skip the first chapter, which is the essence of it all. The essence being - how to see Lord Krsna in all acts. Without this, all Vedic sciences become instruments of maya, meant to delude the conditioned soul further.